At best, tiers stand as a reference in guiding contracting between biopharmaceutical manufacturers and payers. Actual co-pay amounts are the defining metric. The co-pay sets implications for coverage among patients. What matters in translating intent-to-use is Patient AWP: the Ability and Willingness to Pay of each patient. The effect of this AWP demands that manufacturers understand the patient as a consumer. The new knowledge required for contracting and engagement encompass demographics, income, and behavior for the patient; information that is the same as used to define purchase patterns for consumers. This point reinforces a simply fact - the patient is a consumer. Focusing on co-pay levels and Patient AWP provides a means for biopharmaceutical companies to structure contracting and commercial activities across payers that optimizes brand ROI. Assessing the underwriting strategy used by payers is central to gauging whether and how to contract. The assessment determines whether a manufacturer gets what it pays for under a contract and the extent that a manufacturer can benefit even without a preferred contract position. A key point to consider is that tiers are simply a means for payers to contract with manufacturers in securing rebates. The actual dollar value of co-pays across benefit designs reflects decisions by payers on risk selection as well as care and risk management. Underwriting further defines co-pay levels in meeting expectations for a drug's total cost by plan sponsors. The calculation for a payer and plan sponsor is in defining the amount to budget for coverage vs. the amount assigned to the patient. Payers and plan sponsors negotiate coverage levels and rates using dollars - not tiers. The dollar amount determines the cost for the sponsor and the patient as a member, as well as a consumer of medications under the plan. Figure 1 illustrates the effect in practice of combining underwriting with tiers in a hypothetical situation. The dollar amounts set in underwriting a pharmacy benefit often fall across co-pay tiers. The internal trade-off for the payer is assigning the dollar value in meeting cost requirements for the sponsor vs. optimizing rebates from manufacturers. The two decisions are not necessarily consistent and result often in creating a structure for the patient that is cost independent of the stated formulary tier. 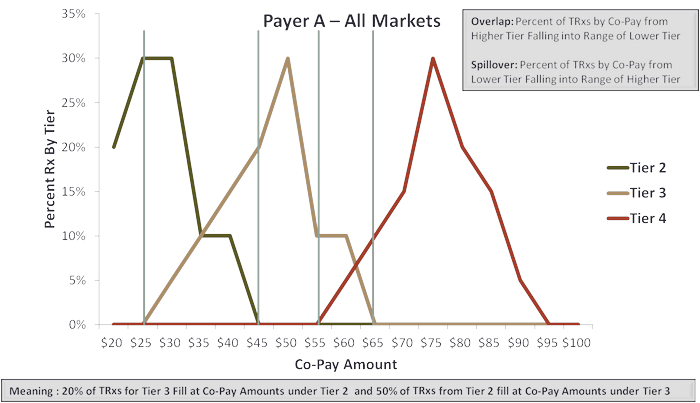 Overlap is the percent of total prescription volume in a lower tier filled at a co-pay level falling within the next higher tier. Overlap becomes the percentage of prescriptions on a tier filled with a patient cost that is higher than the tier. Spillover is the counterpoint to overlap. This is the percentage of total prescription volume in a higher tier filled at a co-pay level falling within the next lower tier. Spillover becomes the percentage of prescriptions on a tier filled with a patient cost that is lower than that tier. Overlap between Tier 2 and Tier 3 as illustrated in Figure 1 is 20%. That means 20% of total prescription volume from Tier 2 were filled with a co-pay amount falling within Tier 3. The manufacturer contracting for the Tier 2 position is 'losing' that benefit for 20% of total prescriptions. The flipside applies for the manufacturer contracting under a Tier 3 position in this illustration. Here, 50% of total prescription volume was filled at a co-pay levels falling within the range of Tier 2. The manufacturer 'gains' the benefit of what in effect is Tier 2 pricing for one-half of the total prescription volume on Tier 3. The implication for manufacturers is clear - forget tiers - focus on the dollar value of co-pay amounts. Defining the existence and the extent of overlap and spillover between tiers determines whether a manufacturer realizes the full potential for contracting. Additionally, the assessment allows the manufacturer to determine the potential gain by contracting for a higher tier and realizing the advantage of spillover. Ability and willingness to pay (AWP) is central to defining consumer behavior is all areas - other than health care. That's rapidly changing with the ongoing shift in health care costs to consumers. Patient out-of-pocket (OOP) cost is a major component of payment for branded medications. Whether a patient is able as well as willing to make that payment may significantly determine the choice between one brand and another, between a brand and its generic, or even getting the prescription filled at all. Reality is that household income varies. That variance applies with the dollar amount of a co-pay. Figure 2 illustrates the effect for three hypothetical co-pay amounts. Co-pay amounts noted are independent of tiers. The key point is focusing on the dollar cost to a patient - not the tier. The availability of funds - household income - is a major influence on how a patient perceives the cost of a co-pay; that relationship underlies patient ability, and to a degree, their willingness to pay. This combined effect is Patient AWP. A reference point for the illustration in Figure 2 is household income above or below $70,000 per annum. 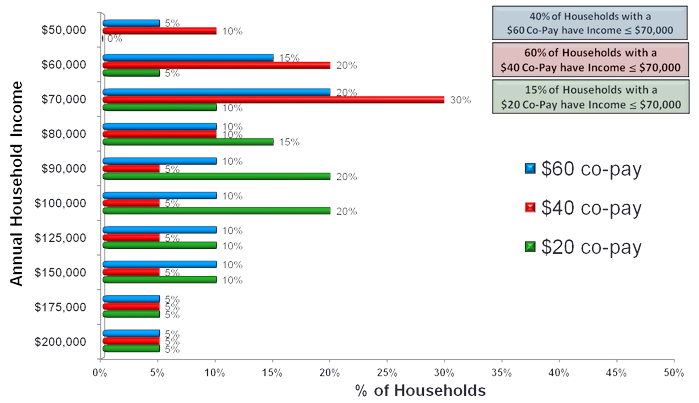 The percentage of households falling above or below that line varies across the three co-pay levels. That 'fact' helps define whether, how, and at what level a manufacturer can intervene in potentially 'offsetting' the negative effect of cost upon the patient decision for using a branded medication. The assumption is that all patients are in commercial programs. Assessment excludes patients with coverage under Medicare and Medicaid. A key objective for the manufacturer is defining the levels of household income specific to each co-pay offering the greatest potential for an 'offset' increasing brand use. The rough-cut for this assessment as illustrated in Figure 2 is the percentage of households with income below $70,000 per annum. The result of the assessment is to focus on options to influence 'purchase' behavior for a branded medication for these households at each co-pay amount. The practical effect is considering whether, how, and at what level to intervene tactically. That intervention includes samples, coupons, vouchers, and co-pay cards. All of these elements constitute means to offset the cost of a branded product. Where and how to use each offset results from the evaluation of the Patient AWP. The tactical plan for the 40% of households facing the $60 co-pay would differ from that considered for the 15% of households with exposure to the $20 co-pay. Regardless, treating equally all households at all co-pay levels is no longer an option. Constructs are interesting. Use in practice drives value for a brand. Figure 3 (again hypothetical) translates the evaluation of Patient AWP into field-level applications. 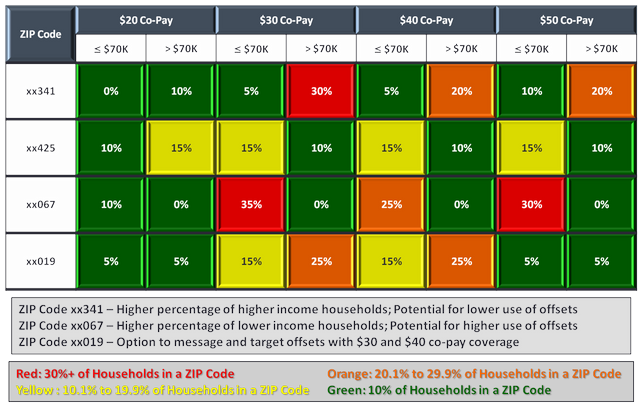 The figure presents co-pay level and household income by ZIP code with the color scheme denoting specific combinations of household income and co-pay exposure by ZIP code. The result is the ability to visualize where there are greater or lesser needs as well as opportunities to intervene. Selection and targeting for the specific 'offset' builds on evaluating the combination of household income versus co-pay exposure. Selection and targeting for the specific 'offset' is a means to considering allocating resources by ZIP code to address the potential gain for 'offsetting' co-pay exposure specific to the dollar amount of that co-pay and level of household income. The combination further provides guidance on which offset to use: coupons, vouchers, or co-pay cards. Samples also have a potential role in bridging a patient to using a medication where ongoing payment of a co-pay is not a barrier. That assessment again captures the value in making decisions using Patient AWP. Patient AWP offers further advantages for manufacturers. One is messaging. Understanding Patient AWP, the combination of co-pay exposure with household income, offers a means to refine the 'value' message for a brand. That refinement reflects value of the brand relative to out-of-pocket costs and household income. Messaging now also reflects the percentage distribution of Patient AWP across providers within a ZIP code. The value proposition to a provider in one ZIP code differs from that in another. The difference reflects effects of exposure to cost and household income. An additional benefit to the manufacturer is refining the allocation of sales and marketing resources using Patient AWP. This allocation includes the 'offsets' as well as deployment of other marketing programs and sales calls. Whether and how to engage builds upon the means to best affect patient behavior toward using a brand. That calculation builds on understanding the combined effects of co-pay exposure and household income within each ZIP code. Dynamics in the health care market negate the benefit in focusing on tiers. That reflects the dominance of underwriting in setting plan cost for sponsors and the continuing trend to increase consumer out-of-pocket costs within coverage. Patient AWP provides manufacturers the means to gauge the effects of overlap in co-pay amounts across tiers and act upon those differences by assessing effects against ability and willingness to pay. Linking household income with co-pay exposure provides a basis to re-think how to optimize brand performance using 'offsets,' as well as overall allocation of sales and marketing resources. David's current efforts as a life sciences consultant focus on integrating information across health care in defining specific programs that enhance commercial performance, clinical outcomes and costs of care. David previously led commercial and financial performance for Medicare and Medicaid programs with MedImpact, Global Commercial Investment & Pricing Strategy for Wyeth, Finance & Business Development for PATHCOR and LifeNavigator, and the managed markets consulting group at EURO RSCG. He began his career consulting with CMS and state Medicaid agencies on program designs for payment with physicians, hospitals, and long-term care facilities. David has a Master's Degree in Health Economics and Finance from the Wharton Doctoral Program and a Bachelors in Political Science (Russian and Soviet Studies) thru The University of Chicago.